Shaming Firms That Export Jobs Has Worked For Trump So Far : The Two-Way Analysts are watching to see whether the Twitter blasts continue and threatened tariffs emerge. The strategies could save jobs or could hurt the economy if other countries retaliate. 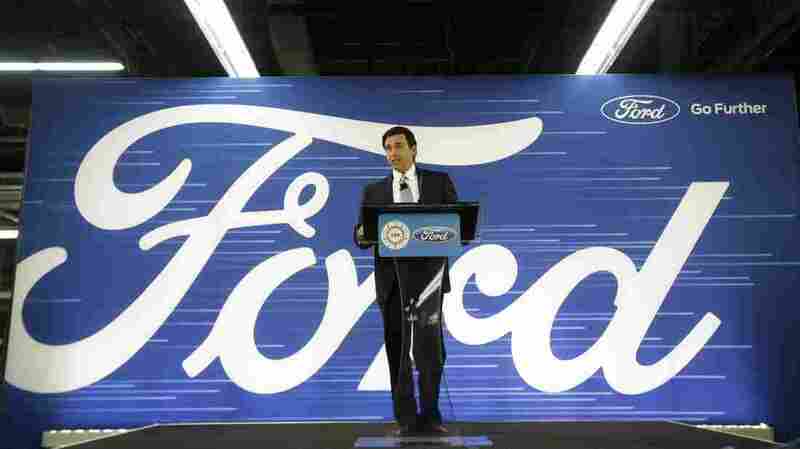 Ford CEO Mark Fields addresses employees in Flat Rock, Mich., on Tuesday, about changing plans to build a new factory in Mexico. That announcement came a couple of hours after Trump took to Twitter to criticize General Motors: "General Motors is sending Mexican made model of Chevy Cruze to U.S. car dealers-tax free across border. Make in U.S.A.or pay big border tax!" GM responded that only a small number of hatchback models are manufactured in Mexico and sold at U.S. car dealers. "All Chevrolet Cruze sedans sold in the U.S. are built in GM's assembly plant in Lordstown, Ohio. GM builds the Chevrolet Cruze hatchback for global markets in Mexico, with a small number sold in the U.S."
Why did Ford change its mind? The move marks a departure for Ford, whose CEO last month said it was looking forward to working with the Trump administration on trade but that it very likely wouldn't change plans for its $1.6 billion factory. Now CEO Mark Fields tells NPR that Trump's rhetoric was a factor in reversing the earlier decision, but one of several factors. He says the carmaker was influenced by promises of new tax and regulatory reforms and the prospect of keeping jobs at home. "Ford is a global automaker, but our home ... is right here in the United States," he said. What is the significance of this change? It means 700 additional Ford jobs will come to Michigan, and Ford says every factory job is likely to create another seven related jobs. "We've created 28,000 jobs and we've invested $12 billion in the U.S. in our plants in the last five years," Fields said in a press conference. Shifting a factory itself would not be news but for the fact that it is highly unusual for companies to respond to direct, public pressure from an incoming president. "I know from talking to business people that no major firm wants to be a subject of a Trump tweet," says Gary Hufbauer, a senior fellow at the Peterson Institute for International Economics. He says companies realize Trump controls the Justice Department, the Defense Department, the IRS, Treasury and regulatory agencies, and "the amount of control that intersects with what companies are doing is enormous." Will such moves inspire retaliatory trade barriers that hurt other U.S. firms and cost American jobs? Trump has pledged to rework U.S. trade agreements, including the North American Free Trade Agreement. Trump has also called for high tariffs on companies that manufacture products overseas and then import them for sale in the U.S. The question is how broad such tariffs would be, and whether American trading partners would object and retaliate with similar measures. So far, Trump has (or claims to have) put pressure on American companies including Carrier, Sprint, Ford, Boeing, Lockheed Martin and GM. But Hufbauer says if Trump makes good on actually raising tariffs, "I think some form of retaliation [from other countries] is almost certain." Who's next, and what is the possible economic impact? So far, tweeting trade and other corporate policy has played well for Trump. He has targeted Boeing for a potentially large contract to build a new Air Force One, and he criticized Lockheed Martin for its expensive F-35 fighter jet contracts. Hufbauer says it remains unclear what the economic impact of all this will be. So far, the tweets have gotten a massive amount of media attention, and that may mean it will continue and that others — consumer brands in particular — could find themselves targets. "Some people may wrongly think this is the way to create jobs in the U.S.," Hufbauer says. "My estimate is that this kind of thing [companies responding to tweets] is not going to have a major effect," and it is not in keeping with a well-functioning economy," says David Dollar, senior fellow for the Brookings Institution.